Here is a question that has come to mind which I am looking to solve. 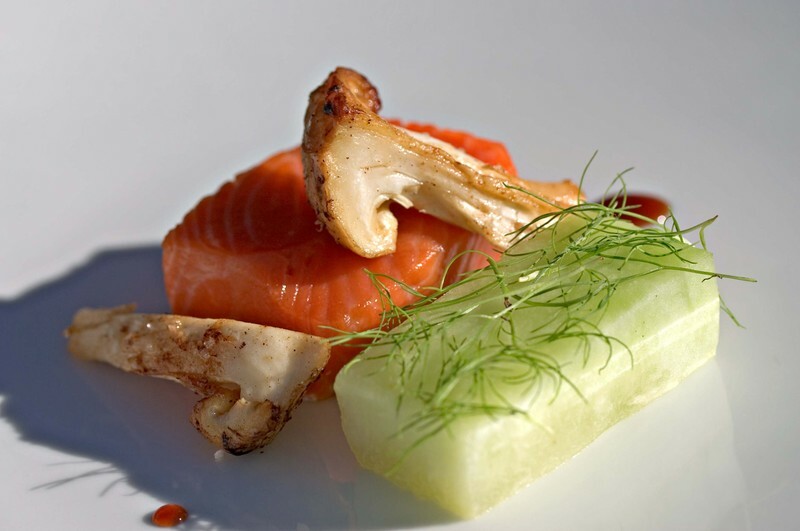 There is a distinct difference between the flavors of grilled and smoked. The char, the aroma, the everything. Every time I think about our grilled potato ice cream I get excited because the flavor is spot on, the aroma and tastes also point directly to the flavor of grilled potatoes in a cold silky medium, ice cream. Smoked is a bit more aggressive. Yes, there are many things that are over smoked, like my shirt when I am going through a smoking (of foods) phase. My question is how to distill or capture the essence of the grill? I have seen liquid smoke, but what about liquid grill. Imagine making a BLT sandwich with grilled mayonnaise. What if we could make grilled butter? Think about leeks cooked in a foil package buried in ashes with that sweet, charred, grilled flavor. How can we capture that and use it in other venues? 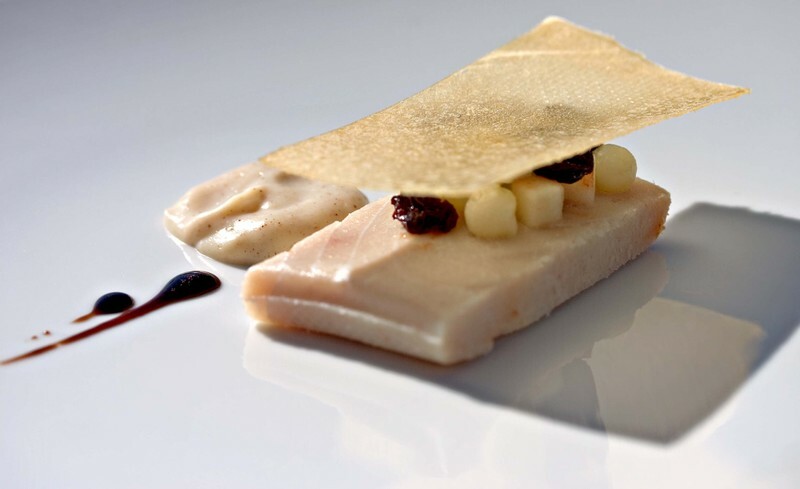 We have been working with a number of clear broths recently from buttermilk to foie gras. For the most part these broths have been used as is to be part of a dish. Occasionally we have used the broths as a cooking medium like our brown butter braised artichokes. ( a far greater flavor combination than the required barigoule which we had executed for years) Recently it dawned on me that these intense broths are the key to transferring flavors and weaving together tastes and aromas. For example, we have now begun poaching pears in chorizo water and poaching apples in foie gras consomme. Why? Because it tastes great and is an excitingly simple means for marrying flavors. 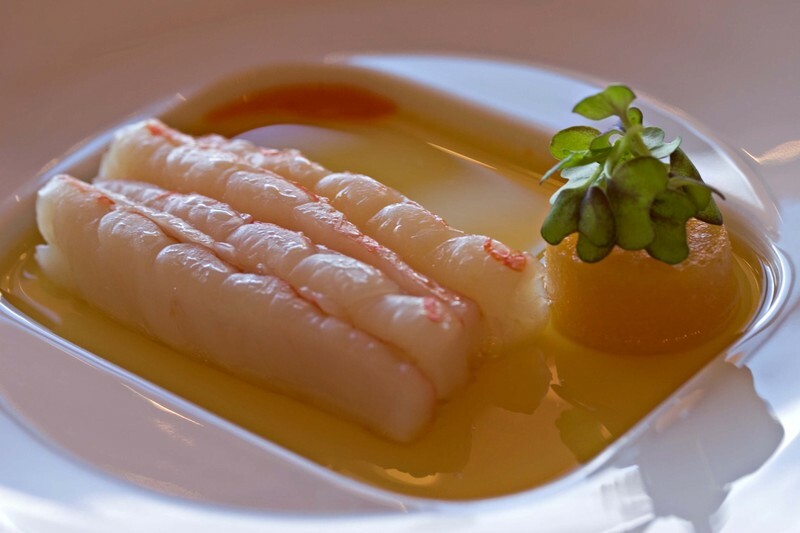 Upcoming will be crustaceans poached in clear buttermilk and lamb cooked in miso tea. If we can simply expand the means in which flavors are blended why should we hold back. Think of the possibilities. Everyday we come to work and the last thing on our agenda is cooking. Pretty funny huh? The tank has run dry today. I will roast another chicken for dinner and serve some broccoli and cheese soup to start. Why? Because that is what our guests want. Well, it is the perceived needs of some of our guests which translates to what all people want. It could be that we have not gotten out of here for now over six weeks. It could be that we have been told that our five our ribs served with black and white beans is to gourmet. It could be those damn Versace plates and the ornate dining room. It could be that we have been told that a hunter's menu would be great as we serve burgers at the bar in front of a football game. It could be that the fit is just not right. We get the job done with a smile on our face and an empty inside. I realize I am griping. I need to gripe now and again. You see, we are practicing. Every day gets us closer and in some way shapes our outlook and approach to food and life. I really enjoy roast chicken (the one mentioned above), brined in soy sauce and maple syrup. It tastes great. Mashed potatoes are equally appealing with their great aroma and an even better taste. We used to make them with butter and creme fraiche, you know fancy. Yesterday I revisited butter and buttermilk mashed potatoes. They were better. The constant rehearsal is tiresome. I become consumed in the mundane and the inherent pressures of trying to be everything to everyone. Guess what, it's just not possible. And yet it is asked of us everyday. Just keep trying. Yeah, that is the answer. It is an answer, just one that does not sit so well with me right now. In trying to be everything to everybody we are actually spinning wheels just to watch them turn. You know why most country clubs are mediocre. Because they are run by the guests where the club must be everything to everybody. Places, restaurants, experiences that are truly unique and special are not for everybody. They are something truly grand to a finite number of people. OK, here is the real kicker. It is just not that hard. What? Well in this case I am referring to food, but I could mean life or just crossing the street. It takes time and attention to detail, but at the end of the day it is really just a bunch of simple things done in sequence to create, make or be part of something great. This morning was blessedly quiet and peaceful. I love being the first to arrive in the morning. I make my way through the kitchen flipping switches and brewing coffee, unlock the front doors and head up to the office to go over yesterday's checklists, to do lists, and any correspondence that arrived during the wee small hours of the morning. On a good day, none of the guests are up when I arrive or they're all out hunting, as they were today. This gives me a bit of space to start my day and organize my thoughts. When I finish up in the office I head down to the kitchen to make lattes for myself and Alex, unless there's a huge pile of stuff in the office, in which case he has usually arrived by the time I make it downstairs and the coffee is waiting for me. Normally the phone will start ringing around 7am, which 9am in New York. East Coasters are oblivious to the time difference. If no one's there at 7am to field their calls they are slightly outraged, as though we should all be working the same hours regardless of time zones. Also our employees call early, especially when they're calling to say something has come up and they will be late or absent. In these instances they tend to call as early as possible in the hopes of avoiding a real person at the other end of the phone line. Frankly I'm not a phone person. The years when I spent hours talking on the phone are long past and at home I can sit right beside a ringing phone and completely ignore it. This drives Alex insane. He is incapable of ignoring the phone and almost as ineffective at extricating himself from long, involved conversations with guests. He's a chatty creature and seems unaware of the passage of time when he's involved in a verbal exchange. This is where my ever so slightly anti-social tendencies come in handy, because I can get things done while he's yapping, I mean conversing, with our guests. At work I'm not allowed to ignore the phone and it's amazing how often it rings when it's in my possession. This morning though it was silent, no one was calling in sick or late, no one calling with frantic deadlines, reprimands, sales pitches, endless questions or anything at all. By eight the silence was getting to Alex and he picked up the phone to make a call, only to discover that the lines were dead. We checked a few different rooms and came to the conclusion that none of the phones were working. Then we radioed the barn and thankfully discovered that their phone line was fine. Paul made a few calls for us and someone should be out to check on the phone system around noon. Which in Pagosa time means anytime after twelve and before six. The circuit board for the phone system is probably fried, it seems to happen about every 6-9 months. Fortunately our guests are still out in the field. Phones are important to the hotel and I hope to get them restored soon. For the moment though, I for one am enjoying the silence. This morning is relatively quiet. It could be that the phone lines are down and our guests are out hunting. Yesterday I began work on sheets of cuttlefish. My first thoughts were to mimic the Vietnamese spring roll. This morning I changed direction and began work with an anchovy-espelette pepper-onion sauce Aki made. 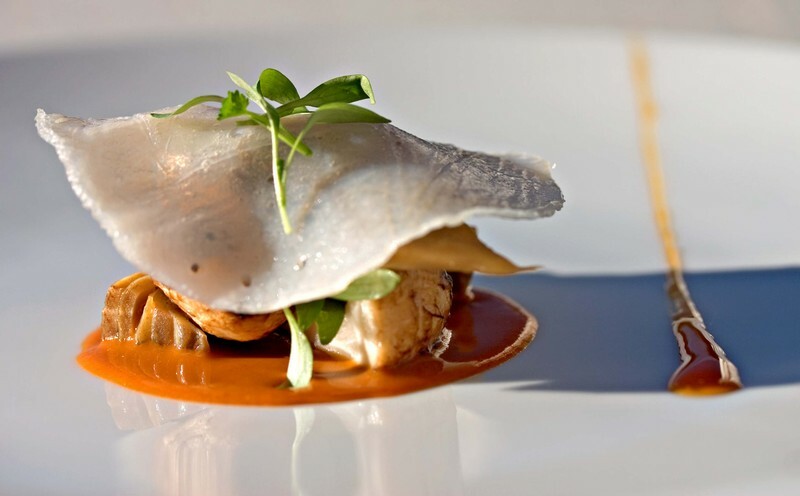 We used the sauce as a base for a ragout of artichokes and matsutake mushrooms topped with the warmed cuttlefish sheet. 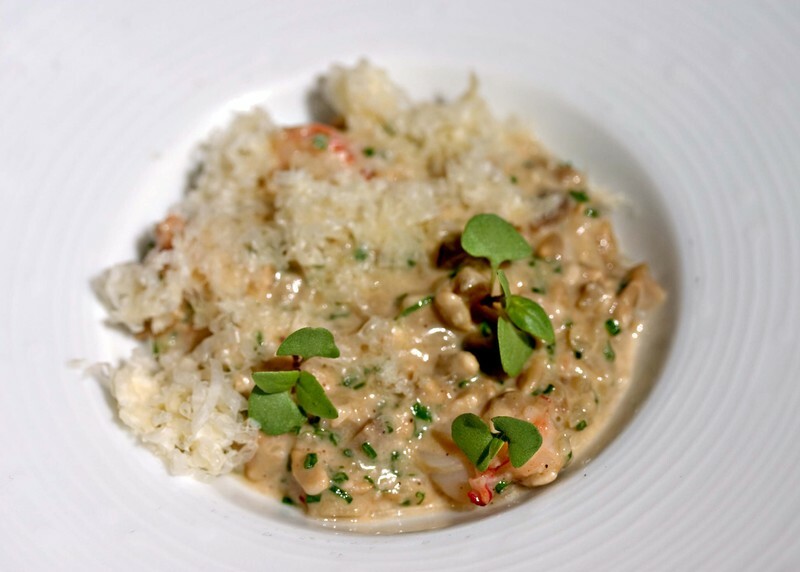 A passionfruit sauce piques the palate and young cilantro ties the dish together. Combine flour, baking powder and salt in the bowl of a food processor and pulse to blend. Add tamarind and pulse to incorporate. With the machine running, pour in the hot water and let it run until the mixture becomes a rough dough. It should be warm and slightly tacky but cohesive and not sticky. You may need to add a couple of tablespoons of water or flour depending on the texture of your dough and finish it by hand. Wrap with plastic and let rest for an hour before forming the cavatelli. As you form the cavatelli either using a machine or by hand, lay them out on a lightly floured sheet tray. Cook or freeze immediately. The cavatelli can go straight from the freezer into a pot of boiling water to cook. These should be served slightly al dente for a slightly chewy texture. For those without a lot of experience with tamarind, these have a rich tangy flavor so choose your accompaniments accordingly. Yesterday we began our execution of dishes which incorporate tamarind cavatelli. The little pasta are tasty bites with a nice chew and an intense lingering tamarind flavor. 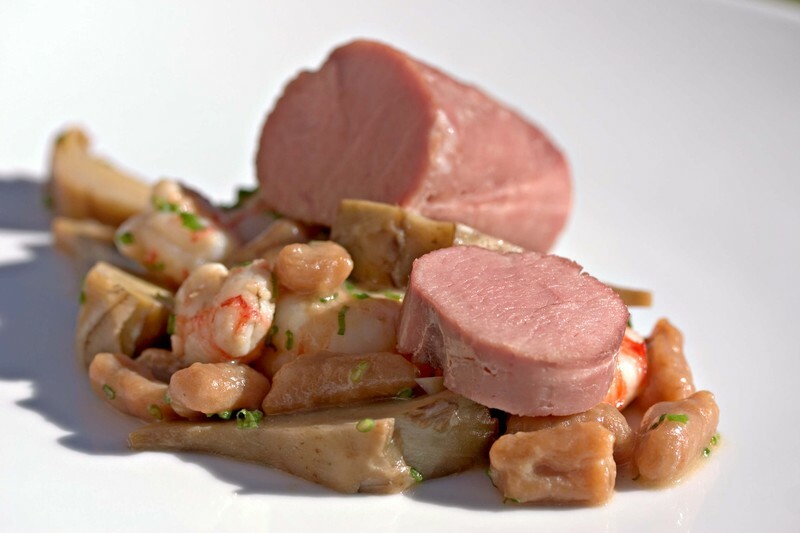 In working with the pasta we put together a dish of slow cooked pork tenderloin with the tamarind cavatelli, brown butter braised artichokes and rock shrimp. The dish is tasty, though in retrospect the cavatelli ragout stands quite well on its own. While we did not serve this dish, it is certainly a fun jumping off point for the uses of tamarind cavatelli and a delicious snack for me. 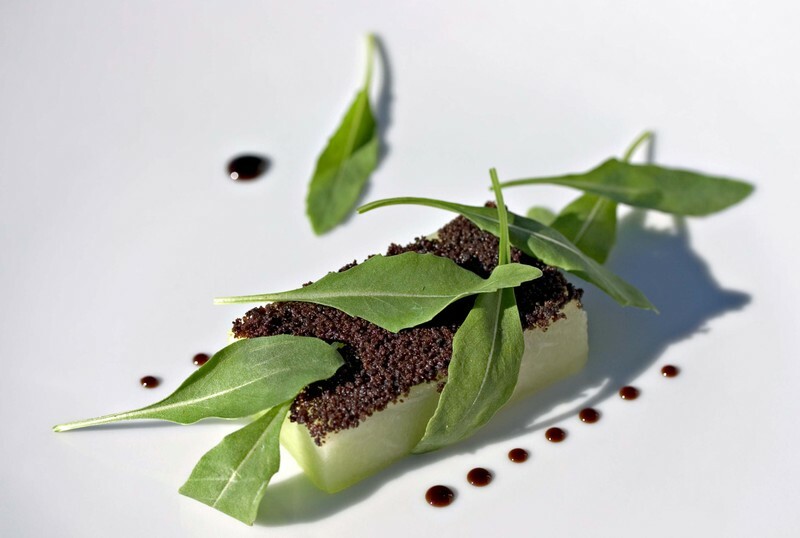 Here is our honeydew melon salad with olive crumbs, smoked Dr. Pepper and olive leaf arugula. We add a pouring of olive oil to finish the dish. Alright, we are back. 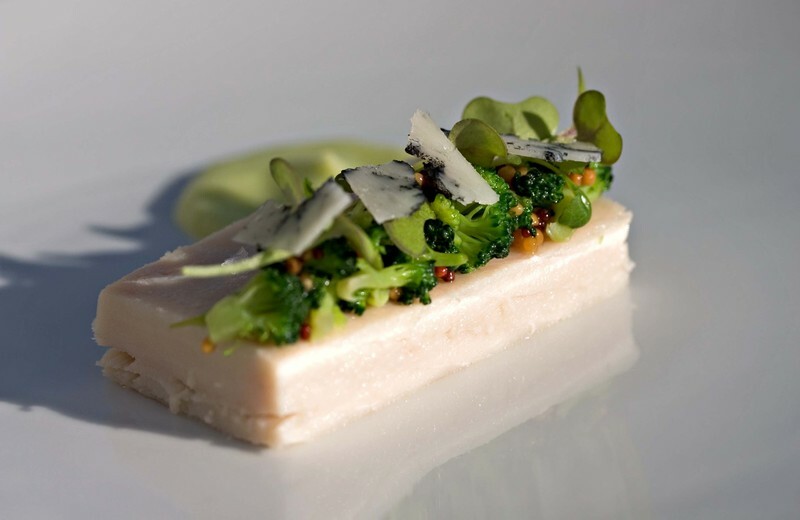 Here is a new wahoo dish with a broccoli stem puree, a floret ragout with pickled mustard seeds, mustard leaves, and marble cheese. It's been a bit sparse around here these last couple of days. We've definitely missed our usual minimum of one post a day but what can we say...things have been a little bit nutty, and still are. We're thankful that we have a great staff and that most of our guests have been a lot of fun to have around but there's drama swirling under the surface at this warm and friendly Guest House. Hopefully no one visiting us has noticed. So, when we have nothing positive to say, sometimes silence is the best thing for everyone. We try never to blog about anything we may regret. We'll get back to the food as quickly as we can. Is there anything wrong with good home cooking? I am talking about thought out, tasty, well seasoned, home cooking. People relate to great home cooking especially since not many people do it anymore. Recently we have been pulled in a number of directions. The one which is currently winning is really tasty home cooking. That is what people want, especially if they are staying with us for an extended period of time. Sure, we can perform the ancient art of weaving and integrate our concepts and ideas into the really good home cooking. The question is how can we fix it? Or, better yet how can we make the idea of really good home cooking into something greater? That is our newest challenge. On a side note, the concentrated parsnips became a thin translucent crisp. Aki, as she often does, starts projects which inspire me. Several days ago, she took some unpeeled parsnips and loosely wrapped them in foil and roasted them in the oven. After about half an hour the kitchen was permeated with the sweet smell of roasting parsnips, a smell reminiscent of baking gingerbread though distinct on its own. When the parsnips were fully cooked, she allowed them to cool and well kind of forgot about them. I on the other hand had not. I took the parsnips and peeled them. The interior flesh reminded me a bit of the dried squid and cuttlefish we have worked with. This visual association prompted me to continue cooking the parsnips in the dehydrator. I was going to make parsnip powder. Well, I did not end up making parsnip powder, for when the parsnips were completely dry they mimicked the dried squid exactly. I tasted the roasted and dried parsnips and the flavor was truly the essence of parsnip. Now comes the challenge of utilizing it. Today we were able to fine tune a steak preparation which I am quite happy with. 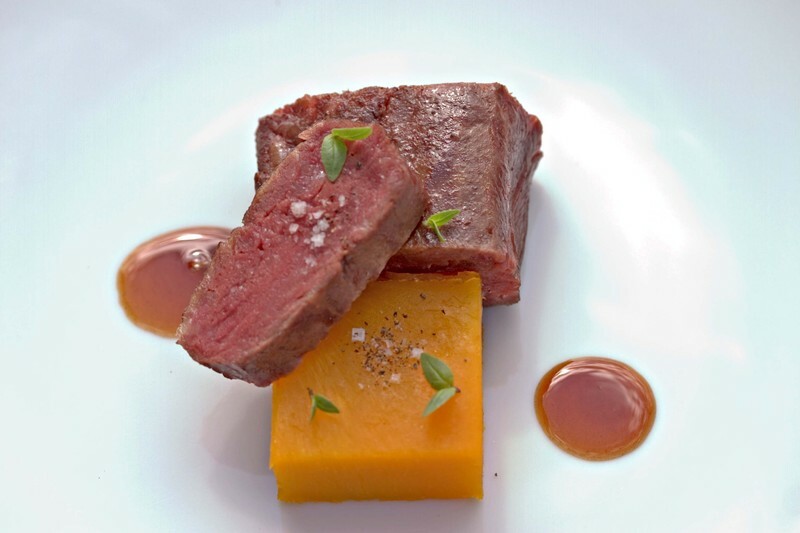 It is a flatiron steak served with slow cooked buttercup squash, onion syrup and basil. The squash is cooked with smoked maple syrup. The utter simplicity of this dish is its strong suit. Last week a gentleman in the dining room sent back the ketchup. Many may assume that he sent it back because it was loaded with high fructose corn syrup or genetically modified fruit. Those people would be wrong. He sent it back because it was organic. Organic Heinz ketchup to be sure, but still organic. He didn't want that organic ketchup on his food, no siree. It was an interesting moment. Because sometimes we forget that there are two sides to this story. For each of us that wants to make better choices and take small steps towards a more sustainable food chain and healthier planet, there's someone else who doesn't. They don't see anything wrong with the status quo. They can have a variety of reasons for their choices, but the fact remains. They don't want organic ketchup, grass fed beef, free range chickens. They don't want those things anywhere near their plates, they don't want to talk about it, they just want to eat and be left alone. That's their choice and we have to respect that. Agreeing to disagree is after all the backbone of the American way. We can't knock the very freedom that our country is founded on. My first impulse was to go out to the dining room and explain why we offered organic ketchup. But, it was clear that he wasn't interested and that to do so would be perceived as aggressive and inflammatory. So I let it go. We all have to make our own choices. Once we give up the mutual respect that allows us to do so, we open the door to ugly places and impossible situations. So, although I may not always applaud your choices, I will always try to respect your right to choose. We do not travel often. Yet, we are quite lucky to have contemporaries around the country and the globe who do and share their stories and inspirations. These are the culinary conversations I talk about which trigger many of our thoughts and force us to revisit older ideas. 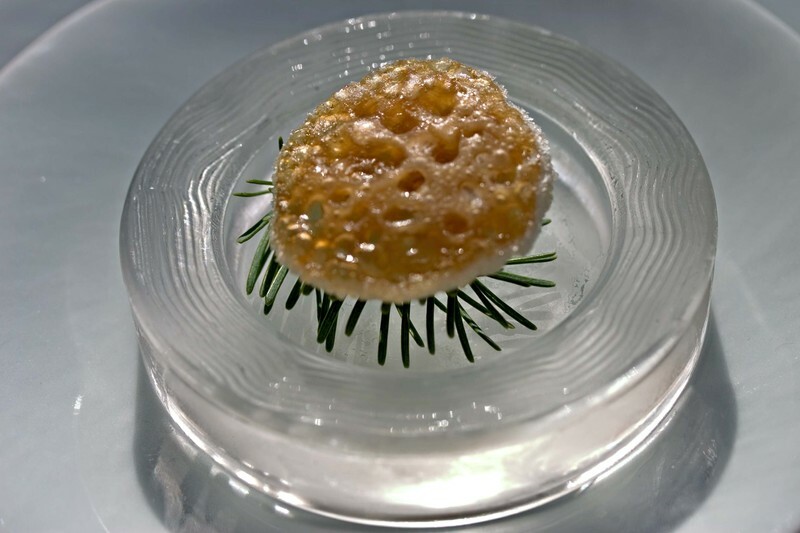 In talking with Wylie, he mentioned he was working on a new dish featuring tender pine nuts. The dish sounds amazing, though I am not sure if it has gone public yet, so I will refrain from discussing it further. Anyway, his tender pine nuts reminded me of some braised Brazil Nuts we were working with about a year ago. The Brazil nuts came and went, tasty but not truly mind blowing. Wylie was looking at nuts in another form and that sparked several of my thoughts. The first was to have tender almonds as an integral ingredient. We cooked the almonds and served them in a dish with turbot and clams. Again tasty, interesting and exciting but not exceptionally memorable. After having some success with cooking almonds I began to think of what other nuts could be cooked till tender. My mind immediately went to sunflower seeds because of their size and shape. I was looking to do a dish in the style of risotto without using the rice. Tenderized sunflower seeds would be the perfect stand in. So, I went about cooking the sunflower seeds until they were tender. I then folded in some butter, creme fraiche, minced artichokes and porcini mushrooms and some diced shrimp. The mixture was finished with chives, lemon juice and some young basil and Comte cheese. The tender nutty nature of the seeds in conjunction with the other ingredients creates a rich and decadent dish and ruse at the same time. We have fine tuned our just warmed purple asparagus dish. 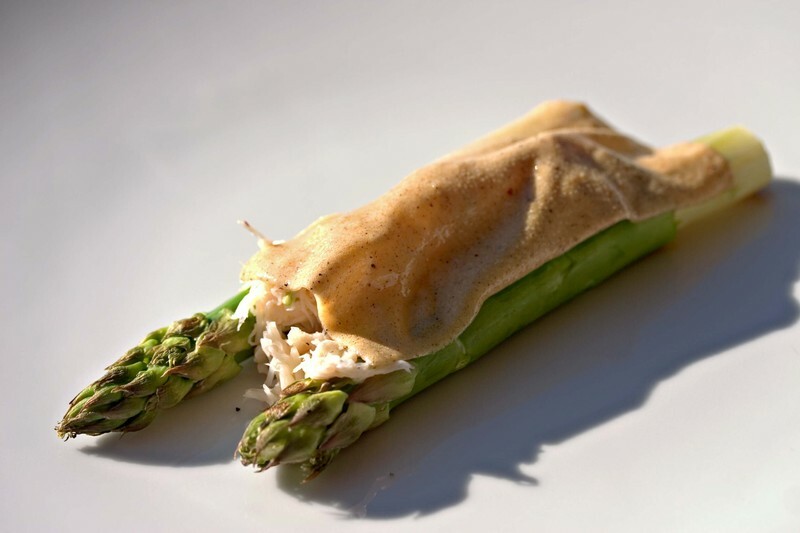 The key elements are the same, we have just sliced part of the asparagus under the hollandaise sauce blanket for ease in eating. Over at Silverbrow, Anthony has a podcast of an interview with baker, cookbook writer, and photographer Dan Lepard. I've only had time to listen to the beginning but I know that I'll go back to hear the rest. They're talking about some of my favorite subjects (food and photography) and I always enjoy hearing stories from other chefs and cooks. So if you have the time and the inclination, go check it out. Time can catch up with you. We have had a truly great week with a ton of new dishes, ideas, concepts and revelations. Today I hit a wall. We have not had a day off since mid August and that may have something to do with the appearance of the wall. Anyway, I am spinning my tires in the mud, postponing writing we are supposed to do and recipes we are supposed to write. I am quite tired of the supposed to. Think about it, many of our most interesting (at least in my mind) ideas have come when we did what we were not supposed to do. I am not promoting reckless and unsound actions. Rather I am talking about doing it differently. Time to do something different, let's see what happens. 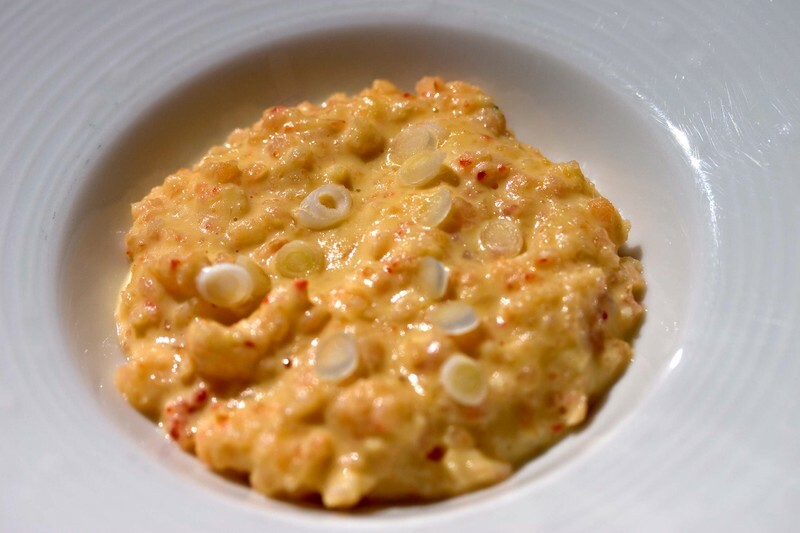 Here we serve warmed Key West pink shrimp in clear buttermilk with warm peach, red mustard and crustacean oil. We have had some conversations about this dish and look to improve upon it as soon as we get our hands on some spot prawns. I have now spoken with the Vancouver chef who supposedly wrote the horrid email we received, bashing our food and promoting his restaurant. The chef, a true gentleman, was apologetic and livid at the thought that someone had written such an email in his name, forging his signature. He was also wondering who the heck we were and why someone would write to us in this manner. Aki and I are equally disturbed because the importance and credibility associated with one's name and signature apparently no longer exists. It appears anyone can be anyone, throwing stones at people from afar or worse, ruining someone else's reputation for reasons of spite or plain maliciousness. We have in many ways been causalities of a form of identity theft. Sure, the email was an ugly thing, but the deeper issue is about credibility. What if we hadn't been suspicious of it's origins? Questioning of the fact that any Chef would put their name to such a document that could be easily reproduced and replicated for the world to read? What if we had published it with the Chef's name intact? Then the writer of the this digital forgery would have gotten what they seem to have wanted, making the Chef in question seem petty and disagreeable, and getting a rise out of us at the same time. And that is something the digital world needs to think long and hard about. Where is the accountability on the Internet? So, at the end of the day the chef in question did not write the letter. Someone else did, forging a signature and utilizing a misleading hotmail address. That is just plain wrong. So the next time you get a letter from someone you don't know, look carefully at it's origins because it may not be from who you think it's from. It may be from someone just trying to play games with you on-line. 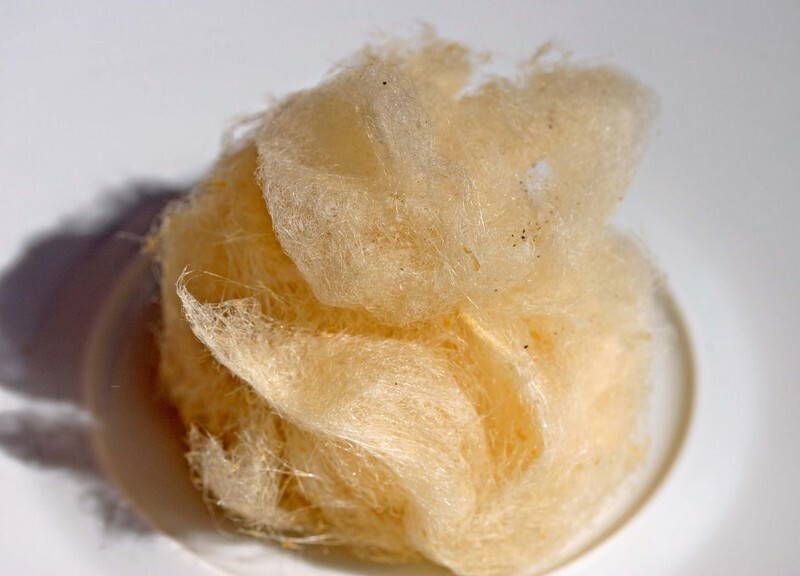 Today we made foie gras cotton candy. No seriously we did. Here, check it out, on a plate seasoned with salt and pepper. Back to work. Here is the dish with our chicken skin crusted scallop. We served it with sweet and sour matsutake mushroom, watercress and roast chicken jugs. The chicken skin works quite well on the scallop, caramelizing and rendering to make a crunchy counterpart to the tender scallop. Aki has a way with eggplant. She looks at an eggplant and makes it taste good. 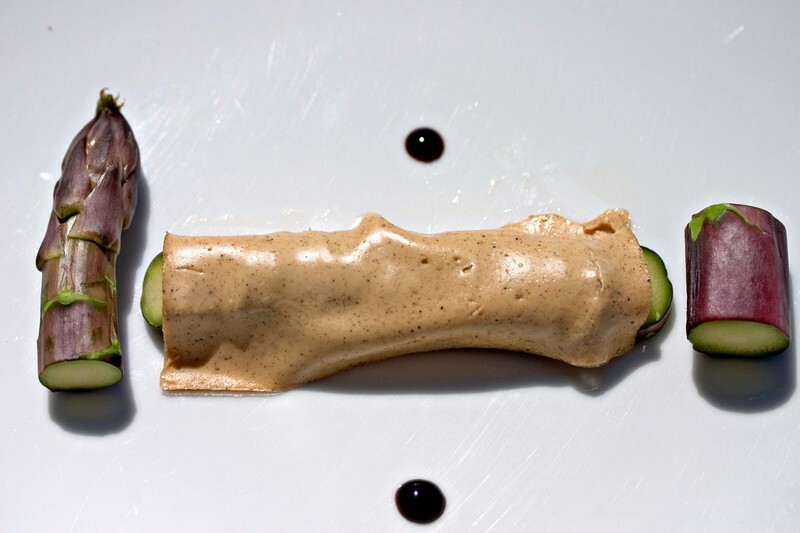 A recent example is a grilled eggplant puree enriched not with tahini, olive oil or butter but fresh goat cheese. I put cheese in many things and the cross of goat cheese and eggplant did not cross my mind. Sure, eggplant Parmesan but I am talking goat cheese. The long and short is the puree is balanced and delicious. We served it with buffalo hangar steak, eel sauce and black radish. On as side note, the julienned black radish looks remarkably like young eels. My mind wanders. Here is one of the dishes we served last evening. It is artichokes braised in brown butter with whipped foie gras and crispy yuzu. 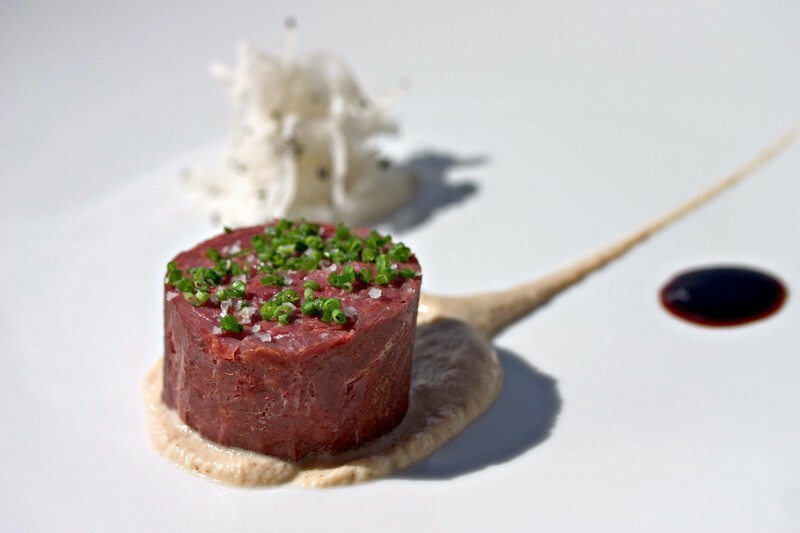 The ability to whip foie gras can be directly attributed to great culinary conversations with our friend Wylie who continues trigger ideas and allow them to be executed. It's Tuesday but it feels like a Monday. The days all run together when you don't actually ever get one off. We made some great things today, savory, beautiful, delicious food. But all I can think about is Nick's Pizza, in the nieghborhood where I grew up. It was a late addition, well after my high school years, which were happily spent at A&J's. On this particular Tuesday evening I would kill for a large pizza, half red, half white with prosciutto and fresh garlic, washed down by a Brooklyn Lager and followed by an untraditional but incredibly luscious and toothsome cannoli. All of which would be cooked by someone other than me. Oh well, something to look forward to in January. If you happen to be in NYC, stop by Nick's and have a pizza for me. Summer is waining while tomatoes continue to peak with flavor. With the nights turning colder we have put together a dish which features warmed tomatoes which explode like ravioli topped with warm mozzarella sheets. The flavors of tomato and mozzarella are piqued with cherry wood aged balsamic vinegar, ground chorizo and some salad burnet leaves. Now that we have foie gras consomme on hand, as well as brown butter savory and sweet, what doors can be opened? My first thought was a soup dumpling. But how are we going to make that soup dumpling? 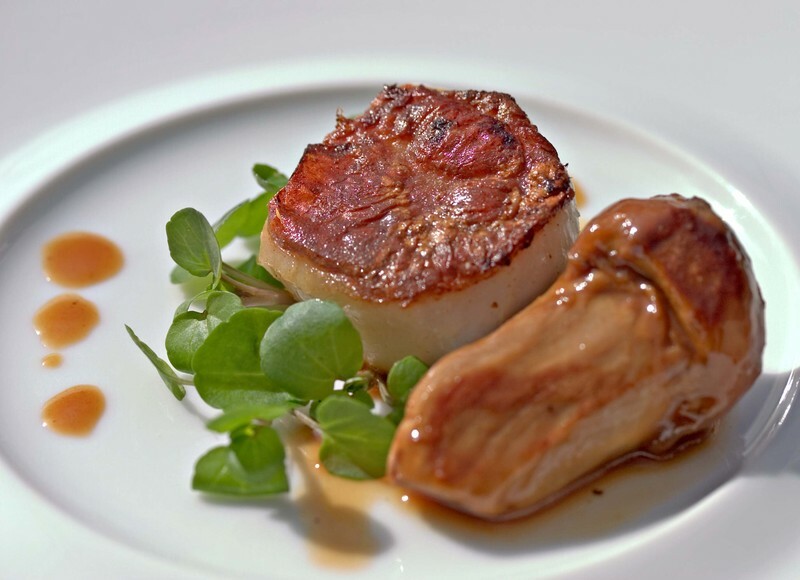 Could we use our hot foie gras base around the foie gras consomme? Perhaps a pasta would be interesting? 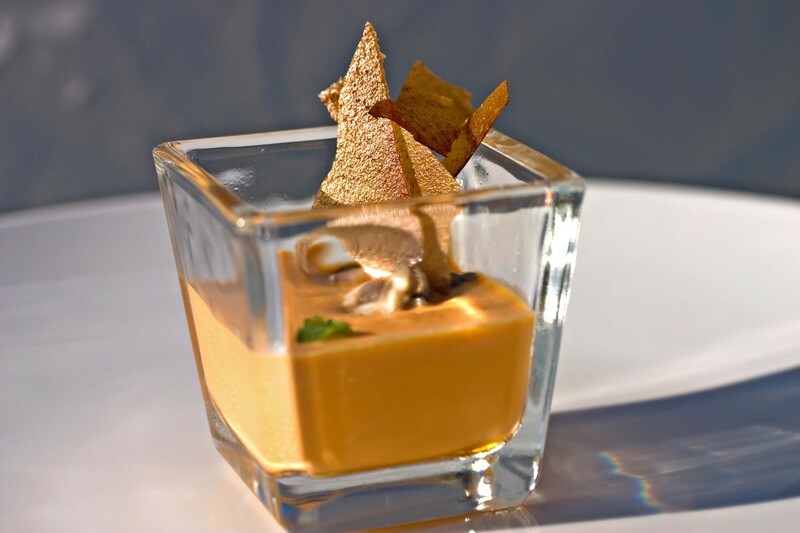 We could try and make foie gras mousse filled with foie gras consomme. Anyway, the growth of ideas from the simple is quite exciting. Speaking of exciting, what could we do with clarified buttermilk? 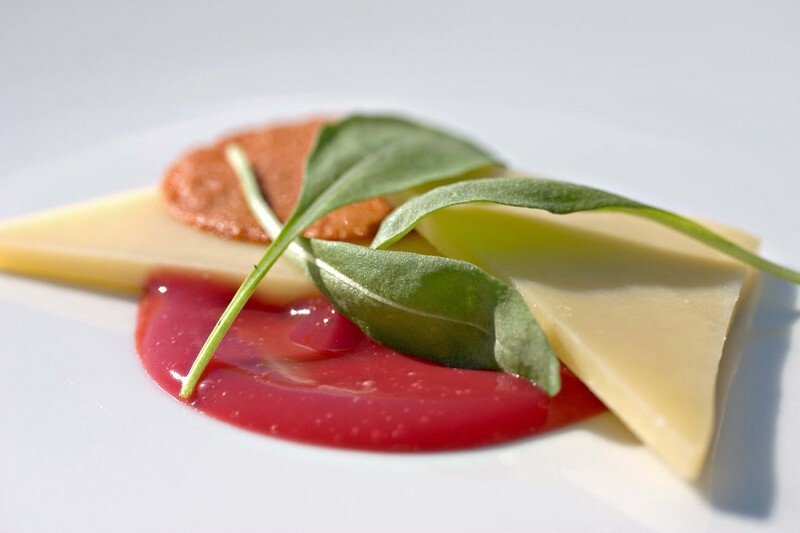 Here is our recent cheese course which featured a nutty Comte. We combined it with arugula, rhubarb and apricot. Well, our brown butter consomme has now become a staple in our kitchen. My next thought went towards foie gras. Foie gras consomme, now that would be interesting. So, we tried it. Oh yeah, it worked out quite well, capturing the essence of roasted foie gras in a clear unctuous broth. 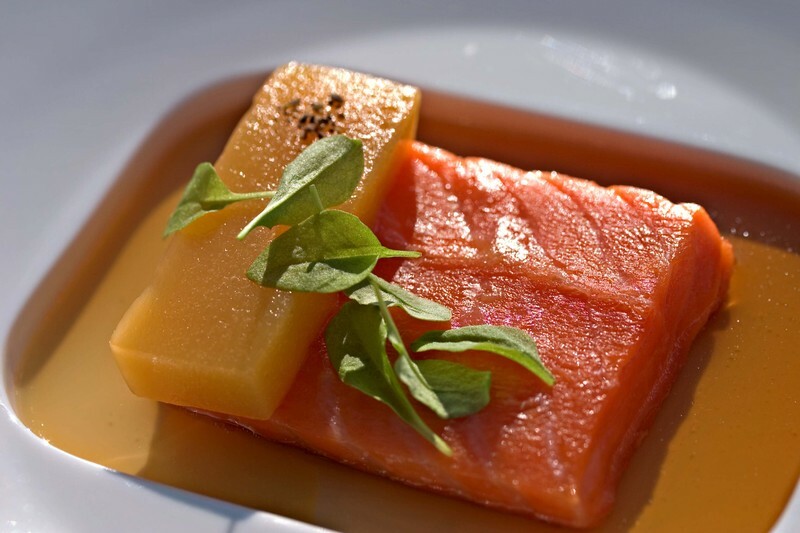 Here we have paired it with slow cooked salmon, warm peach terrine, young sorrel and black pepper. Oh yeah, here is something smoked pulled from our freezer. 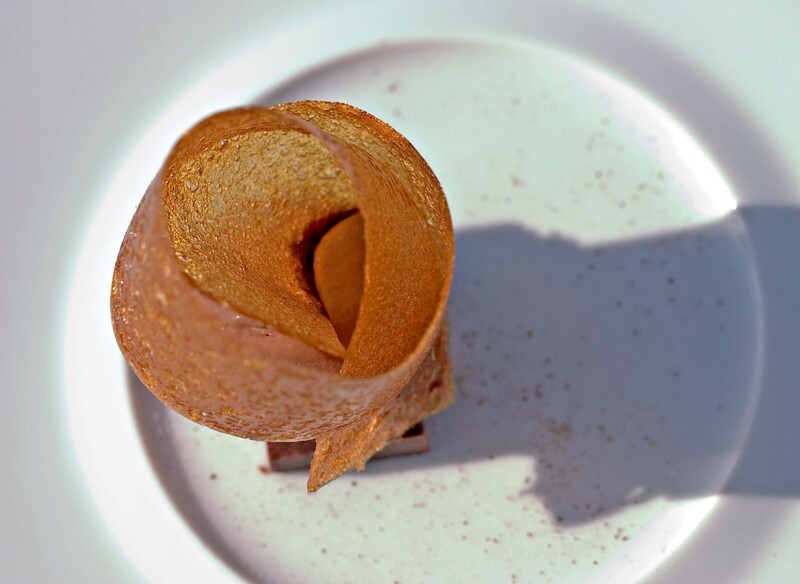 Its our compressed chocolate cake with smoked chocolate ice cream, golden raisin ribbon and long pepper. Here is a dish which is directed by both the marinated anchovies and the pickled red onions. The dish is a quivering preparation of orange peppers with a salad of white anchovies, red onions, anise hyssop and torn olives. Not So Constructive Criticism or Spam? looking around on the internet the other day and came across your website. design a better menu with proper flavor and ingredient combinations. What do you think? Either way the answer is somewhat disturbing. If it is the chef, condescending doesn't quite cover it and why bother to send us anything at all? If it isn't the chef, that means someone out there is impersonating someone else and using their name to do send questionable emails to other people. Accountability is quickly disappearing in the cyber world and that just is not a good thing. We're still debating whether this will be part of a sweet or savory course tonight, but I'm leaning towards dessert. It's an orange pepper panna cotta. 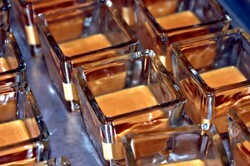 The butterscotch pudding I made last week used a burnt caramel sauce as one of it's flavor components. The burnt caramel sauce reminded me of a story from Walking on Walnuts, a fictionalized memoir of a NYC pastry chef. She wrote about the trials and tribulations of developing a burnt orange ice cream. When I noticed some fat, juicy orange peppers in the walk-in today I decided to juice them and use them to deglaze a burnt caramel. As the sugar melted into the pepper juice and turned a deep amber and orange hue, I decided to infuse the mixture into a panna cotta. We'll see how they turn out. The mixture was sweet and intense with surprisingly spicy notes from the pepper juice. If all goes well, you'll see the finished dish tomorrow and we'll post the recipe alongside it. I actually did record ingredients and procedures this time. Puree the above ingredients together in the blender until smooth to make a mozzarella base. Let's talk for a moment about ideas. There are two camps of readers of this site, those who think we're crazy to give away all of these recipes, techniques and ideas for free and those who think we don't give them enough information to do every little thing that we "show and tell" here. Our basic premise is that ideas are free. Hence a website called Ideas in Food where we freely share what we do in our kitchen. We do explain recipes and techniques for most of what you read about/see pictured here. I must admit that it can be frustrating when people continuously ask how to do something when we've clearly posted the technique here on the site but we also understand that the nature of the blog is that things can be hard to find. Yes, eventually we plan to finish the several cookbooks that we have drafted in our files and publish them. We hope at that time our readers will willingly shell out the money to pay for actual books. But this site is our digital notebooks and we are learning along with you as we experiment with new things in the kitchen. Our dialouge with readers has been a valuable learning tool which has helped us develop many of the ideas pictured on these pages. The interesting thing about recipes and techniques is that even with clear guidelines, two people will inevitably produce different results. That's one of the reasons why we don't mind sharing. 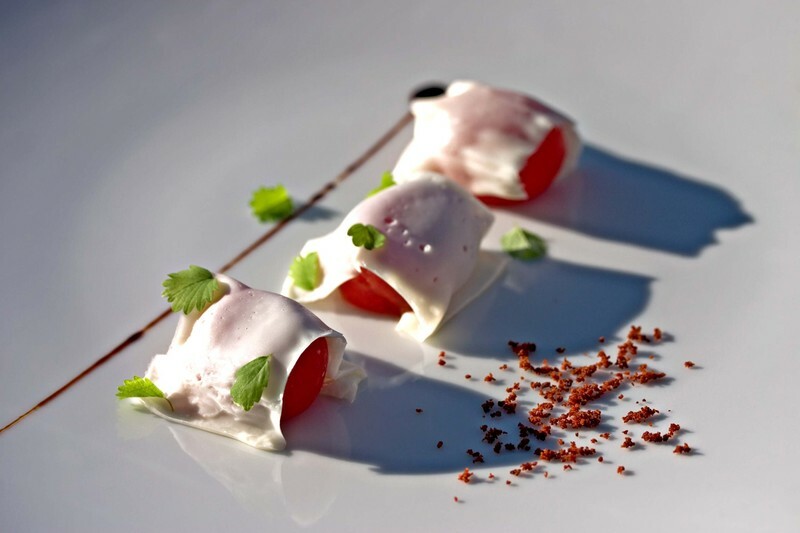 Every Chef/cook will add their own twist to a recipe, they can't help themselves. It's like a fingerprint of sorts and their interpretation may be as good as or better than ours, but it will never be exactly the same. So we don't worry about people copying or stealing ideas because we know that inevitably what they produce will be different from what we come up with. Another reason why we are happy to share is that other people have been very generous with us. Chefs fall into two camps, those who share and those who don't. I'll never forget the day I asked a Chef I was working for how to make a dish that wasn't from my station only to be told "you don't need to know that". It was a startling moment. Why didn't I need to know that? Wasn't I there to learn? Didn't I have the right to know how to make things in this kitchen where I was working extremely long days for very little money? On the other hand, in more recent times there have been Chefs, like Wylie, Shola , and Sean, who have been unstintingly generous with ideas, ingredients and information. It's people like that who remind us how important it is to share. As young cooks it could be very difficult to find the information that we were searching for. The advent of the Internet has been a boon for those who thirst for knowledge, but still, someone has to put the information out there for the next generation of cooks to get their hands on. Truthfully, we don't put every single recipe and technique on here. We tell you how to make most of what we cook. Frankly the reasons why certain techniques get left off are usually quite simple. Either we aren't completely happy with the way something came out and the technique is a work in progress or we (usually me) didn't write down what went into a particular recipe. I just can't seem to get into the habit of weighing, measuring and recording. Alex has become quite disciplined about the process of recording recipes and techniques but I cannot say the same for myself. I'm getting better but sometimes by the time I go to write something down I've forgotten what went into it. He does his best to remind (nag) me to write things down but when things get busy I revert to my old habits. Unfortunately in those instances, none of us actually end up with the recipes in question. So, if you've asked us to post information and it hasn't appeared one of those explanations usually applies. Here we are just playing around with the hot hollandaise sheets. We shall figure out some other uses but this sure is a tasty breakfast. Here's a link to a wonderful, thoughtful essay on food over at 37 Days, which happens to be one of my favorite weekly reads. She was tagged by Tana for a meme and it made for great reading on a hectic Tuesday morning. It will make you thoughtful, hungry, and glad to able to share food with the people who you enjoy spending time with.